Dr. James Santiago's first acupuncture treatment was back in 1973. He was playing high school soccer and injured his ankle. His parents had just came back from China, Korea and Japan, where they were studying acupuncture. They applied acupuncture for his injured ankle and the injury healed much fast then normal. All of James' coaches were amazed. By the late 1980s and early 1990's acupuncture began its growth in large numbers in the United States. 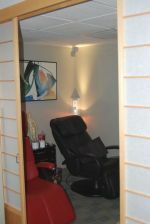 An acupuncture College opened in New York City and Dr. Santiago enrolled in 1995. He later graduated in 1998. He applies his new knowledge to AIDs patients in New York City and to many sports related injuries with very good results.